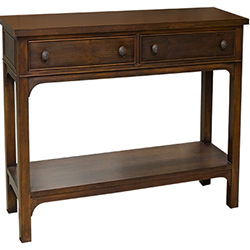 The Carolina Console is made of hand-selected, premier Knotty Pine veneer and Maple Solids. 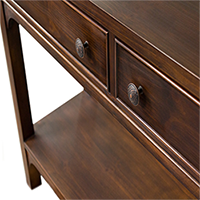 The console reflects the spirit of the Pinehurst Resort with carefully slected veneer and Pine cone knobs. There are two drawers and one lower shelf for storage. A bronze Putter Boy medallion (optional) embellishes the end panel. Pewter hardware is standard. Also available with Bronze hardware upon request. Dimensions: Width: 48.5", Depth: 15.5", Height: 32"